Reduce hand and wrist soreness and irritation with the Vive padded walker hand grips. Quickly installing on any standard walker, the hand grips are padded with a contoured foam to relieve painful pressure points and reduce hand and wrist fatigue. Durably constructed with a breathable, moisture-wicking material, the handles stay cool and dry to provide a comfortable and secure grip every time. Reducing hand and wrist pain and fatigue, the walker hand grips are padded with a contoured foam for a comfortable and secure grip. Generously padded, the walker hand grips relieve soreness and irritation caused by standard walker handles. The latex-free padded walker handles easily install on any walker with a simple hook and loop closure, providing a stable, nonslip surface for your hands to rest on a walker or other mobility device. Simple hook and loop closure allows the padded walker hand grips to be quickly installed on any walker without slipping or bunching. 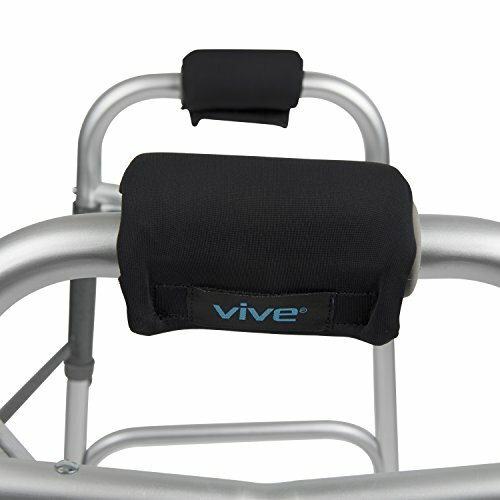 Contoured foam padding evenly distributes the pressure placed on each hand while using a walker and retains its shape for extensive usability. The latex-free walker handles reduce hand pain and soreness and eliminates skin irritation. Breathable, moisture-wicking materials allow your hands to stay comfortably cool and dry. The walker hand grips are also washable for added convenience. COMFORTABLY PADDED HAND GRIPS: Reducing hand and wrist pain and fatigue, the walker hand grips are padded with a contoured foam for a comfortable and secure grip. Generously padded, the walker hand grips relieve soreness and irritation caused by standard walker handles. The latex-free padded walker handles easily install on any walker with a simple hook and loop closure, providing a stable, nonslip surface for your hands to rest on a walker or other mobility device. FITS ON ANY WALKER: Simple hook and loop closures allows the padded walker hand grips to be quickly installed on any walker without slipping or bunching. CONTOURED FOAM PADDING: Contoured foam padding evenly distributes the pressure placed on each hand while using a walker and retains its shape for extensive usability. The latex-free walker handles reduce hand pain and soreness and eliminates skin irritation. BREATHABLE, MOISTURE-WICKING MATERIALS: Breathable, moisture-wicking materials allow your hands to stay comfortably cool and dry. The walker hand grips are also washable for added convenience.